Please note that the content of this book primarily consists of articles available from Wikipedia or other free sources online. The Minneapolis, St. Paul and Sault Ste. 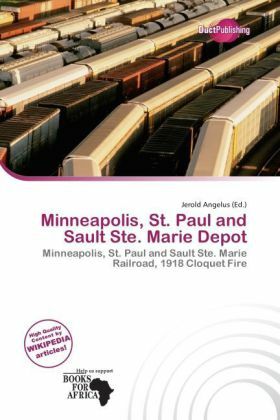 Marie Depot in Moose Lake, Minnesota is a depot built in 1907 by the Soo Line Railroad. The building was one of the few buildings that survived the 1918 Cloquet Fire, and it was used to provide shelter for those left homeless in the fires. The railroad first built a depot in this location in 1873. The 1918 Cloquet Fire started on October 12, 1918, with a background of a hot, dry summer, followed by a fall with little rain. The fire started on a windy day when a spark, possibly thrown from a passing train, ignited nearby brush. Much of the area, from Sturgeon Lake to Moose Lake, Cloquet, and close to Duluth, was devastated by the fire.